Will receive a unique e-Gift Card code to redeem for Deal Dollars within your account. Budget-conscious connoisseurs often have to choose between a haircut and a night out on the town; peer pressure usually leaves their hair on the wrong kind of chopping floor. 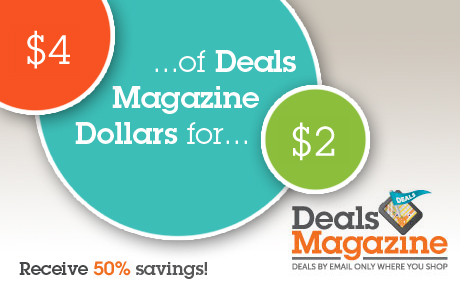 Get the best of both worlds with this deal: for $2 you'll get a $4 Deals Magazine e-Gift card. You'll pay $2 and receive a unique 16-digit e-Gift Card code that you can redeem for $4 in Deal Dollars within your account. Once you purchase a deal, you can get even more for your buck. Choose a deal that is 50% off or better and turn that $2 into $8 or more. But before you do, remember to customize your shopping area to get deals in your most-frequented areas. Also, check out Deals Magazine's keyword-based deal search engine to search for deals on demand.